Something a bit different the medlar is a small brown fruit that is picked in October or even November and then left to blet (decay) for several weeks until the flesh turns brown and soft with a flavour similar to cinnamon seasoned apple sauce. The tree is small with interesting gnarled bark, large green leaves that show good autumn colour and pretty white/blush flowers in May-June. Nottingham Medlar trees tend to be flat topped with a spreading, almost weeping habit. It will grow well in any well drained, moist soil in a sunny position. A great choice for those who like to try something a bit different in the kitchen, ideal for preserves. Our pot grown Nottingham Medlar trees can be planted at any time of the year, whereas bare root ones need to be planted between November and March. Medlar trees should be spaced according to their rootstock, for example a Quince A (semi-vigorous) rootstock will require approx. 3 metres between trees, whereas a Quince C (dwarf) rootstock will require approx. 2 metres between trees. Begin by removing weeds and grass within a metre of your desired planting hole, then dig a square hole as deep as your root mass and approximately 3x as wide. To help your tree establish, sprinkle root grow in the hole. Gently loosen the tree roots and place into the planting hole. Using 50% of the original soil and 50% compost, fill in the hole and firm around gently. Make sure not to bank the soil up around the collar of the tree as this can cause problems. Add a stake and tie to anchor the roots, allowing it to establish more easily. If you’re planting in spring or summer, water the Medlar tree well and regularly for the first few months and increase watering if there are extended periods of hot or dry weather. If you’re planting in autumn, you may only need to water a little. Once you see your fruits begin to swell, water again. Medlar trees do not require a lot of pruning and should not be hard pruned. For the first 3-4 years, an annual prune in winter helps create the right shape. Cut back the longest leader shoots by approximately a third of the previous year’s growth. Remove any awkwardly placed branches that cross the centre, any branches that are crowding the tree and any very long, old branches. 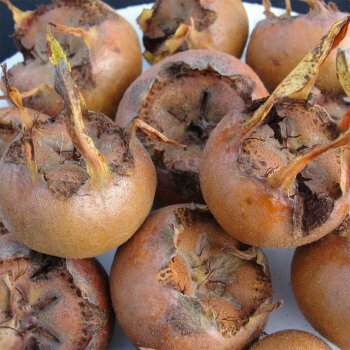 After the first four years, you can simply tidy up your medlar tree each winter. Lightly prune, removing any damaged, diseased or dead branches.